If there is a “sweetest-looking orchid” award, my vote would go to Miltoniopsis orchids. With the nickname “pansy orchids”, the flowers of Miltoniopsis not only smell like heaven, but they also look dainty and innocent. Their grassy leaves are light green and look beautiful enough to stand up on their own without any flowers. With a particularly happy plant, you could even find up to three spikes with twelve buds from the base of a mature pseudobulb. You can imagine what a spectacular sight it is when four or five pseudobulbs mature at the same time! Miltoniopsis belonged to the genus Miltonia until 1976. 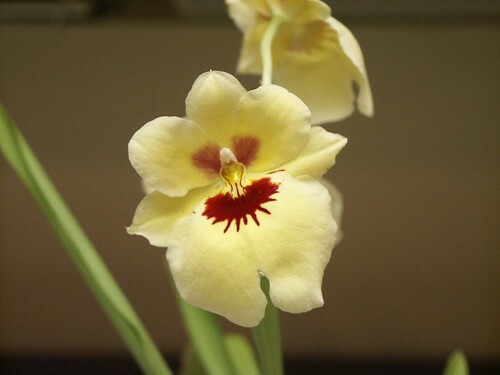 Before that time, people differentiated the two types by calling Miltoniopsis the “cool-growing Miltonia” or “Columbian Miltonia”, even though Miltoniopsis are not necessarily all cool-growing, nor are they all from Columbia. 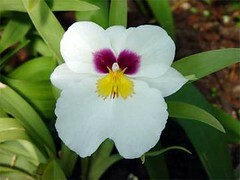 Even today, casual growers still use the name Miltonia and “pansy orchids” to include both Miltonia and Miltoniopsis. It’s good to be able to tell whether your orchid is actually Miltonia or Miltoniopsis because these two plants have different temperature and light requirements. 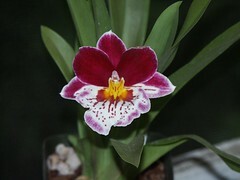 Miltonia orchids have two leaves on each of the pseudobulbs, but Miltoniopsis orchids have only one. Also, Miltoniopsis have flatter pseudobulbs that cluster together closely, whereas Miltonia have rounder pseudobulbs that are farther away from each other. Moreover, Miltoniopsis flowers are pansy-like. (Pansy-like means more or less “round”.) Therefore, even if you get a hybrid that has the name Miltonia on the tag, if it has Miltoniopsis attributes, then you should treat it like Miltoniopsis. The light requirement of Miltoniopsis is fairly low. You may provide your plants with slightly higher light than the intensity for Phalaenopsis. Growing by a east-, south- or west-facing window will definitely satisfy their need for light. You can even grow your Miltoniopsis under artificial light. Four “full spectrum” fluorescent tubes six inches above the leaves for 12 to 16 hours a day will give it sufficient light. Monitor the color of the leaves as they are the best indication to tell you whether your lovely Miltoniopsis orchids are receiving too much or too little light. Light green means they are receiving enough light. But if they are totally pale or almost yellow, you should put them a bit farther from the light source. Coming from the mid to high altitudes in Central and South America, Miltoniopsis orchids enjoy high humidity. You need to provide at least 50% humidity, but ideally 70-80%. The more humidity you can provide, the more heat-tolerant your Miltoniopsis will be. As in their natural habitat, your Miltoniopsis orchids should be moist at all times. In the summer, you may have to water every day, but in the winter, you might have to water as little as every 3 weeks. Keep in mind that they shouldn’t be soggy. Add charcoals and perlite in your potting mix, so that the roots of your beloved plants can breathe through the little gaps. Miltoniopsis have thin roots and they are sensitive to water with high mineral content, as well as fertilizer. Therefore, fertilize your pansy orchids at a quarter of the recommended strength once a week when they are actively growing. Be sure to flush with good quality water at least every other watering. Lots of people think that these orchids should be kept cool, but the reality is that they are more like intermediate-temperature growers. They enjoy temperatures of 80-85°F (27-29°C) during the day and 60-64°F (16-18°C) at night. Some Miltoniopsis orchids can even tolerate temperatures higher than 90°F (32°C) for a very short period of time if humidity is high (80-90%) and air movement is strong. Hybrids will accept a wider range of temperature.